Teknion‘s highly customizable upStage desking option is a unique structural system that integrates desks, tables, cabinets, and shelves—”In an age when just about everything is personalized,” they said, “it’s important for the working environment to follow suit.” We couldn’t agree more! For the full scoop, we had them fill out our product profile Q&A. How will upStage impact the workplace? The workplace is riddled with diverse personalities, all of whom have different preferences and working habits. In an age when just about everything is personalized and customizable, it’s important for the working environment to follow suit. 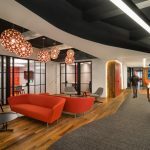 upStage connects individual personalities and work styles by allowing people to independently manage their preferences for visual privacy, movement, orientation, and storage. upStage offers workers control over their physical environments, leaving them empowered, energized, inspired—and most importantly, productive. upStage manages the apparent paradoxes between the need for privacy and the need to be connected to co-workers in the office. upStage is based on a simple platform or “stage” that frees people from the constraints of a benching frame or panel, allowing them to build along horizontal or vertical planes to create layered worksurfaces and multi-story volumes. A truly unique structural system, the staging unit integrates a full complement of desks, height-adjustable tables, cabinets, shelves, cubbies and screens—and serves as a conduit for electrics. With limitless planning styles, upStage eliminates the constraints of a single benching frame or panel, allowing designers to configure workstations in a way that best fits the needs and floorplan of any company. It touches on many of the important aspects of worker well-being that are rising to the top of the most current thinking about effective workplace strategy. Our team recently worked with a major Midwestern construction company to outfit a new space with 1,600 upStage workstations. For this project, the designer was interested in using upStage because it provided a modern and open office look, while also offering the ability to integrate height adjustability and unique storage capabilities. On the other hand, the end-user desired more traditional space division privacy provided by high-panel systems. We were able to create a work station that satisfied both the customer’s need for privacy and the firm’s overall design intent. We created upStage storage between workstations to address privacy and special needs, incorporating a space to hold blueprints and a height adjustable table large enough to accommodate spreading the blueprints out while working. Additionally, we developed stations that can change by department as needed. Teknion’s in-house design team, led by Steve Verbeek. Borrowing the best attributes of a panel-based system and the best attributes of casegoods, upStage creates a new typology for the office that offers maximum flexibility and enriched, experience-based design at both the planning level and the level of the occupant. upStage was designed with personalization in mind—convenience and customization is key to this collection. What do you think our readers will love about upStage? The A&D community will enjoy the creative flexibility that upStage affords. In addition to a wide range of planning scenarios, a rich materials palette gives designers the opportunity to be original and bold, using color and texture to create a more varied and visually inspiring work environment. upStage offers a familiar way of interacting with furniture, which occupants might begin to recognize as similar to their relationship with their home furnishings. Like real furniture, it can be stacked, moved around, or mixed. Additionally, upStage offers a modern look, feel and functionality for a new and more engaging office experience. Given the wide range of product, applications, and finishes available, pricing ranges from a few hundred dollars for a table to a few thousand dollars for a fully featured workstation. Anything else notable that we ought to know? upStage recently won a 2015 Good Design Award. The award, presented annually by The Chicago Athenaeum, celebrates the most innovative industrial, product, and graphic designs around the world. Next articleHow May I Help You, Human?